Update 3/24/17: Today Google announced several Gmail Labs to be retired sometime after 4/24/17. One of those will be the Smart Labels and thus this post will no longer be relevant. See full announcement here. Inbox by Gmail has an incredibly efficient bundling system. But so does Gmail with labels. An issue exists for those users that currently are still torn between Gmail and Inbox by Gmail. There are some bundles/labels that were introduced in Inbox that users seem to not have in their system labels in Gmail. Well, this post is aimed at showing users how to display those new Inbox labels in Gmail. 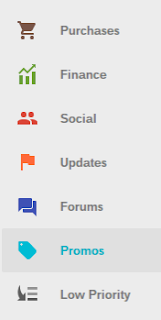 System labels in Inbox include Purchases, Finance, Social, Updates, Forums, and Promos. Gmail system labels include only Social, Promotions, Updates, and Forums. As you can see, Gmail does not offer Purchases and Finance, yet those are available in Inbox. For those that use both Inbox and Gmail, this poses a problem. Gmail users have two options to show the emails that are in Finance or Purchases from Inbox. The first option is a simple search using in:finance or in:purchases and the emails in those bundles will be displayed in Gmail. The second option is to enable a Gmail Lab called Smart Labels. Once you find and enable the Smart Label lab, you will see all six of the Inbox System Bundles in Gmail under the categories section. tomv - I am not sure what you are referring to here? I've disabled the system labels in settings, but they still appear in the left-navigation. Any way to remove them entirely? That is incorrect. The slider switches next to each of the labels in that menu turn on and off the bundling behavior. The labels still appear in the left-navigation. Actually you are asking about hiding them in Inbox, I was answering you about hiding them in Gmail as that is what this post was about. Hi Scott. 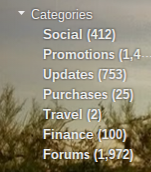 How can we show those missing Purchasing, Finance, Trips categories in the Gmail mobile app? Thanks! Unfortunately it only adds them to the web interface not the Mobile. Thanks Scott - appreciate the reply. I've been digging around as I did for the right settings assuming that I was missing something! This comment has been removed by a blog administrator - what? I'd like to remove Trips, Saved, Purchases, Finance and the rest from the iOS Inbox app, is it possible please ? You cannot remove the system generated bundles. Scott, anyway to turn off the 'Empty Bin' are you sure you want to delete question, after tapping 'Empty Bin' ? Nope that is a security measure to make sure people actually want to do that since its not reversable. How can I get emails pushed for Gmail in the iOS mail app then, please ? Why can I not highlight to copy words in all emails ? I do not know what you mean by gmark label? If we cannot remove Saved bundle from Inbox, how can you show emails in Inbox Saved bundle in GMail?